At age 33, Abernathy was rescued from the Rule 5 scrap heap by the Reds in November 1966, then paid them back by posting a 1.27 ERA in 1967, while leading the NL with 28 saves! 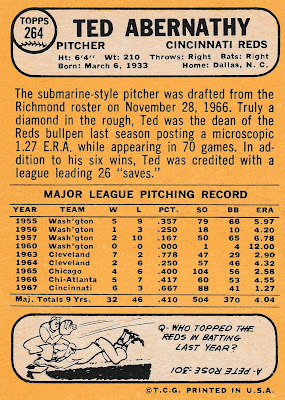 In his 2 seasons with the Reds (67-68), Ted led the league in appearances (70, 78). His pro career began way back in 1952, when he was signed by the (old) Washington Senators and assigned to their Class-D team. 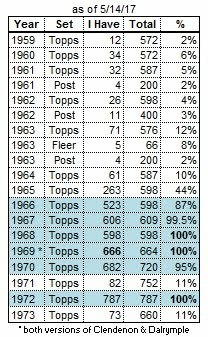 After 2 seasons in the low minors, Ted missed the 1954 season while in military service. Abernathy made his major-league debut in April 1955, pitching in 40 games for the Nats (including 14 starts). He split the ’56 season between Washington and triple-A, then was back with the Senators for all of 1957, appearing in 26 games. 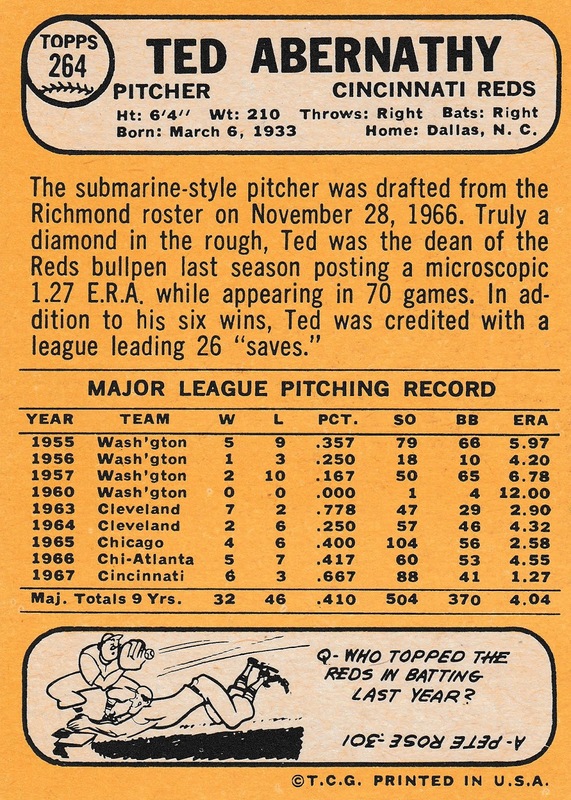 Ted spent all of 1958-62 in the minors, except for 3 innings with the Senators in April 1960. After shoulder surgery in 1959, he became a side-armed "submarine style" pitcher. After his May 1960 release, he was signed by the Braves the next month, and traded to the Indians in 1961, but he would not return to the majors until May 1963, with the Cleveland. After 2 solid seasons with the tribe (43 and 53 games), he was sold to the Cubs in April 1965. Abernathy led the NL in games (84) and saves (31) that season, with a 2.57 ERA. 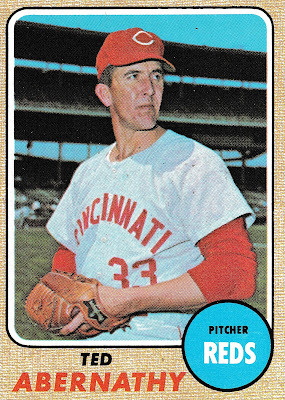 In May 1966 he was traded to the Braves for Lee Thomas, and although he pitched in 38 games, after the season he landed on the Braves’ Richmond roster, where he was stolen by the Reds in the Rule 5 draft. 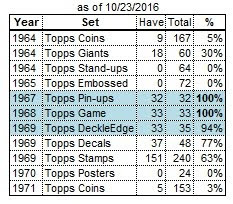 After 2 workhorse seasons in Cincinnati, Ted was on the move again, back to the Cubs for one season. He made an early-1970 pit stop with the Cardinals, before finishing his career with 2 ½ seasons in Kansas City, appearing in 144 games for the Royals before his February 1973 release, a month before his 40th birthday. He passed away in 2004 at age 71.